Stretching across the Nazca plains - like a giant map or blueprint left by ancient astronauts, lie the famous Nazca Lines of Peru. 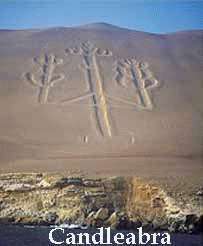 It also known as Nazca figures, Nazca Pictures and Nazca Images. 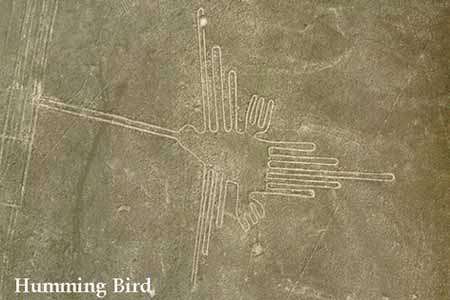 The Nazca Lines are an engima. No one know who had built them or indeed why. Since their discovery, the Nazca Lines have inspired fantastic explanations from ancient gods, a landing strip for returning aliens, a celestial calendar, used for rituals probably related to astronomy, to confirm the ayllus or clans who made up the population and to determine through ritual their economic functions held up by reciprocity and redistribution or, a map of underground water supplies. There are also huge geoglyphs in Egypt, Malta, United States (Mississippi and California), Chile, Bolivia and in other countries. But the Nazca geoglyphs, because of their numbers, characteristics, dimensions and cultural continuity as they were made and remade through out the whole prehispanic period, form the most impressive as well as enigmatic archeological group. The Nazca Lines are located in the Pampa region of Peru, the desolate plain of the Peruvian coast which comprises the Pampas of San Jose (Jumana), Socos, El Ingenio and others in the province of Nasca, which is 400 Km. South of Lima, covers an area of approximately 450 km2, of sandy desert as well as the slopes of the contours of the Andes. They cover nearly 400 square miles of desert. Etched in the surface of the desert pampa sand about 300 hundred figures made of straight lines, geometric shapes most clearly visible from the air. They were supposedly built by an ancient civilization called the Nazca. The pebbles which cover the surface of the desert contain ferrous oxide. The exposure of centuries has given them a dark patina. When the gravel is removed, they contrast with the color underneath. In this way the lines were drawn as furrows of a lighter color, even though in some cases they became prints. In other cases, the stones defining the lines and drawings form small lateral humps of different sizes. Some drawings, especially the early ones, were made by removing the stones and gravel from their contours and in this way the figures stood out in high relief. eh, Nazca Lines. There appear to be two kinds of designs: the first are figures of various beings and things and the others form geometric lines. The former consists of figures of animals, plants, objects, such as anthropomorphic figures of colossal proportions made with well-defined lines. There are also drawings of flowers and plants, as well as representations of deformed animals and other strange Nazca figures. An example of this is the drawing of a weird being with two enormous hands, one normal and the other with only four fingers. Also represented are drawings of man-made objects such as yarn, looms and "tupus" (ornamental clasps). All these figures have well-defined entrances which could be used as paths or to allow people to line together along the conformations of the drawings. The anthropomorphic figures are relatively few and are situated on the slopes. The most well-known being The Astronaut at 32m length an E.T., discovered by Eduardo Herran in 1982. Others are The Man with a Hat and The Executioner and they also appear to be the most primitive. 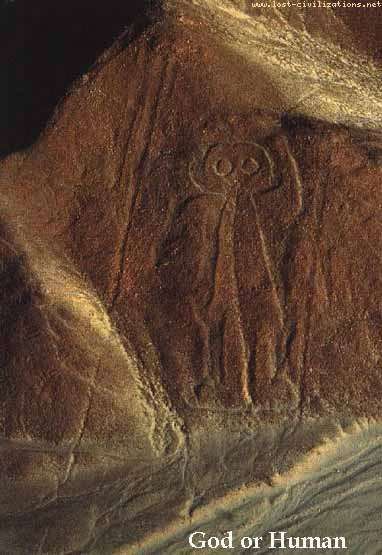 These figures are very similar to the small petroglyphs found in the rocky areas of the region. Spirals of consciousness? Sacred Geometry? Many lines are random and seem to have no pattern to them. They are seen over the scattered seemingly at random over the desolate plain, crossing and intersecting for no apparent reason. Maria Reiche - Astronomical Calendar - She was the most famous Nazca Researcher. Lines should show in direction of the rising of important stars and planetary events like sun solstices. 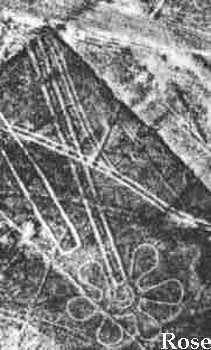 that drawing you have with of the nasca lines,one of the drawings is labeled trapazoid an arrow with rocket cone behind it.guess what there is and old painting called the nuremburg ufos,in the painting there is a painted ufo,it is a long arrow with a rocket like cone on the back of it. Thanks! This lly helped with my report! The Nazca are are truly amazing. The newly discovered massive grid type network of lines on a desert in Egypt are is equely impressive, Lines or ancient canals 25 to 30 feet wide and equely spaced miles long . a little fyi; an anime series (japanese cartoon) has made important references to these lines; in Yu-gi-oh 5Ds, they're called Earthbound Gods Earthbound Immortals in the US and the ones used are the astronaut (cpac apu), hummingbird (aslla piscu), monkey (cusillu), orca/killer whale (chacu challua), spider (uru), lizard (ccarayhua) and the condor (wiraqocha rasca). 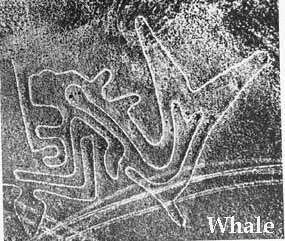 Probably one of the main reasons why several people started to get interested in the nazca lines is because of that show. 10-year-old is right. They are the Earthbound Immortals. they do come to life. I just got back from vacation and I saw them in person! it was awesome! it gave me a hard-on! I find this very interesting. My step-son, wife and friends just returned from Peru and was telling me all about it. Thank you for letting me be a part of it. WOW, these drawings are so pretty!!!! you all do know that all that might be is simply just the writings of and anchent and forgot lingo. i meen serisly who ACTUALY beleaves that they were made by aliens? I agree with curious. They're here to warn us about something. What would happen if they took a picture of all the figures? I know it's done, but what if they went as high as they could until the images were just barely visible and took it? Put all the pictures together, adn then look. Maybe all of the random lines and pictures show an even bigger picture. But what could they be warning us? Maybe, like 10-year-old said, the books by Anthony Horowitz are right in a way. It says that every 10 thousand years all the stars will align with the lines except for one. What if that did come true? What would happen? Question? if you can only see the lines from way up in the air, and the incas couldnt fly, why are they here. unless Anthony Horowits is right in his book, Evilstar (good book) and the animals in the lines come to life, im stumped. theres one that shows a large resemblance to a dog which if i am correct were not introduced to the america's untill the europeans came.. that is except wolves also .. some of this kinda makes me think it is a hoax or something... after all with the airplanes flying over the area why was the spaceman only discouvered in 1985? oh well.. makes you think doesnt it? i think that the nazca lines were put there to warn us about something. the lines were there to protect and warn us. for example if the incas did make the nazca lines to warn us, take the monkey for example on one hand it only has 4 fingers on one hand... this is a deformity which is a warning. i belive this was not just a mistake i belive that it is trying to contact us in some way to warn us. This site has the best pictures of places. If olny it had the places i needed! Yeah i agree with raynebow. How do you think the nazca lines were made? Do we know for sure that the Inca's made the nazca lines?My favorite is the monkey i respect people that respect animals!! Fingerprints of the Gods, a must read for those with an interest - opens your mind !